We have a really interesting talk coming up this week. 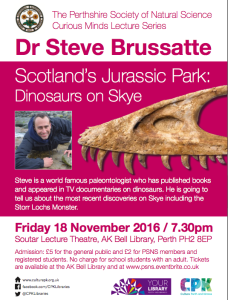 Dr Steve Brusatte, of the University of Edinburgh, is going to tell us about the discovery of Dinosaur fossils on Skye. Friday 18th November. 7:30pm in the Souter Theatre, A K Bell Library. Perth.